Available Colors: Silver, Blue, Red, Black, Green or Purple. Shipping Weight: Cello Bag, 500 per carton @ 18 lbs. 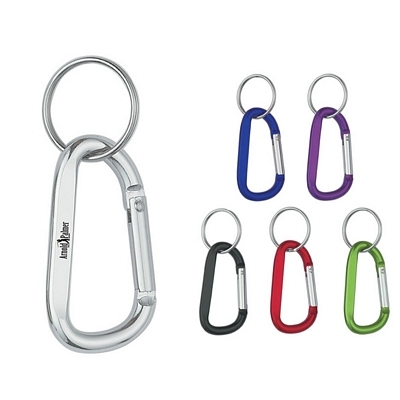 Customized 6mm Carabiner With Split Ring (Item #HT-2081) is Promotional with a Free Artwork Imprint. Promotional Carabiners like our Personalized 6mm Carabiner With Split Ring are decorated with your logo with no setup fees. Customized 6" Broom And Dust Pan (Item #HT-2110) is Promotional with a Free Artwork Imprint. 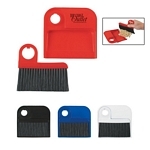 Promotional Dust Pans like our Personalized 6" Broom And Dust Pan are decorated with your logo with no setup fees. Customized Sport Compass Key Ring Item #HT-2089 is Promotional with your business logo for advertising to clients. 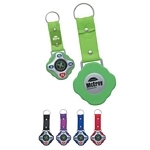 Customized Sport Compass Key Ring and other Promotional Key Tags are decorated with No Setup Fees. 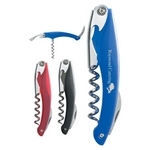 Customized Waiter's Wine Bottle Opener Pocket Knife Item #HT-2100 (Minimum Order: 100). Promotional Customized Wine Accessories can be personalized with your business logo. Our Promotional Wine Accessories are decorated with No Setup Fees. Customized Pizza Cutter Item #HT-2120 (Minimum Order: 250). 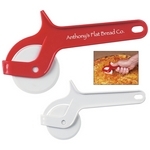 Promotional Pizza Cutters like the Pizza Cutter can be personalized with your business logo and with No Setup Fees.